So, there was this 600lb tortoise sitting on the hose. Thanks, buddy. I don’t need to spread that hay or anything. Parked like a VW Beetle on the bale of hay I’m trying to spread. I asked him to move. I asked nice. He said no. Incidentally, this is reason 1,234 why I love my job. Most mornings, I am on the early shift. It’s my responsibility to open up our department and get us ready for the day. Every morning has its familiar faces and routines. Sometimes I have to stop what I am doing and take a moment to appreciate how lucky I am to spend my time with amazing animals. Remember Al? He’s a bit sleepy in the morning. That makes sense because he is essentially solar powered. He’s most active once he has warmed up a bit. 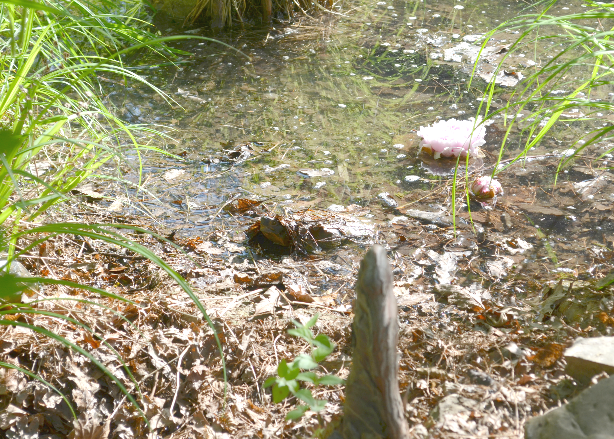 Our outdoor turtle marsh bustles with activity on a warm spring morning. 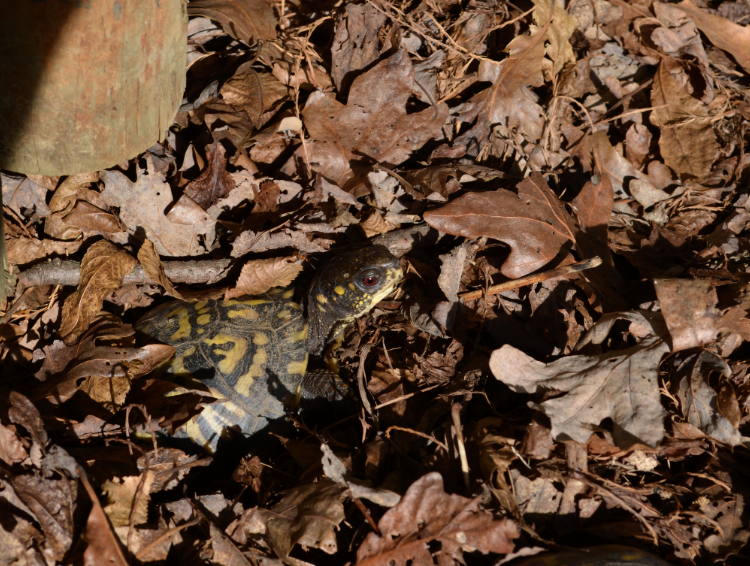 A wood turtle peeks out from his night-time hiding place under the leaf litter. An eastern box turtle hits the snooze button in her leafy bed. And sometimes we find a surprise guest. Hey, you’re not a turtle! 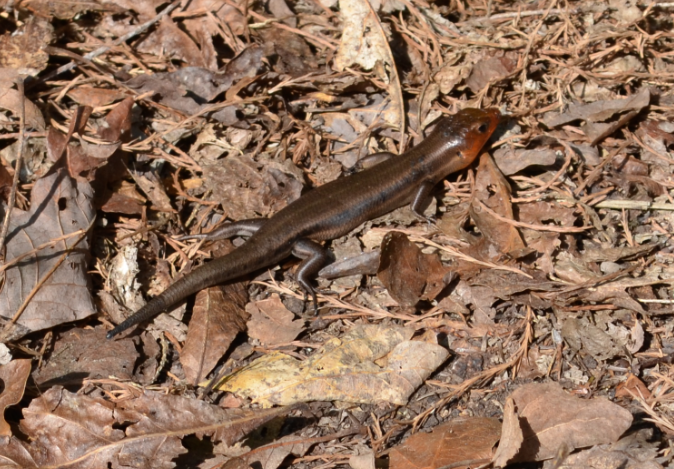 A five-line skink takes advantage of a sunny spot and basks in the warmth of the morning sun. Happy Monday! I have not drawn the winner from the giveaway. I’ll work on that later tonight. In the meantime, you can still go here to vote if you’d like. Entries are closed, but I’d still appreciate the vote. Unless we just won. Which we might have done. I’ll keep you posted! I’m signing up for Camp NaNoWriMo, it’s a little less crazy than the November event because we set our own goals. I’m starting my first new project since getting my full-time job. Anyone want to join me? Go here to sign up! 28 days until the writing begins. I can hardly wait! Nearly Wordless Wednesday: Best Friend, And a Giveaway is Coming! His name is Yorrick. I knew him well. Okay, not that well, but he’s kind of hard to get to know. Mostly because he’s dead. 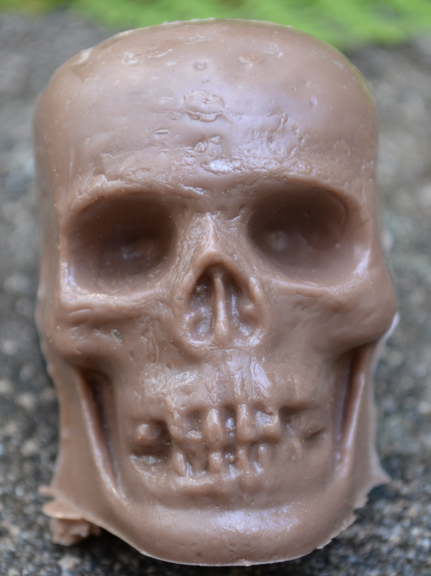 He’s a limited edition design in one of our Mold-A-Matics, and he is amazing. I never buy anything when I go places, but I bought three of him. He’s my new travel companion. Look who’s skullking in the bushes. Selfie at Panera. He’s pretty vain for someone without a face. Keep an eye out for Yorrick here and on Twitter under the hashtag #adventureswithyorrick. Shenanigans are in the air. Soon I’ll be running a giveaway, and some lucky winner will get a Yorrick of their very own. If you’re local, run over to the Zoo as fast as you can to pick up one (or twelve!) for yourself. I don’t know how quickly they’ll change the mold back to an otter. I hit a rough patch a bit ago and kind of ran off the road.. You may have visited that particular ditch in your travels as well, the place where things that would ordinarily slide off like water from a duck’s back instead bring you to your knees, and even the chocolate doesn’t taste good anymore. I won’t bore you with details, but at the beginning of this week, watching my plans and efforts crumble to dust, I wondered why I bother at all. It was a low point. But not today. Today, I remembered. Today, Phyllis came to visit my camp and pooped on the floor, and I remembered how to laugh. 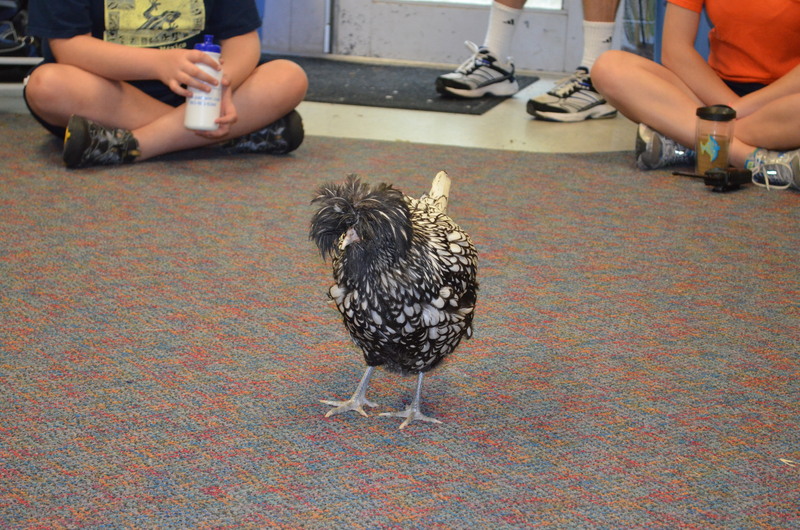 Phyllis the Polish hen. I can’t look at her without smiling. Today, my new friends met my old friends, and I remembered why I love them both. Rex, meet campers. Campers, meet Rex. Want to go to a movie? 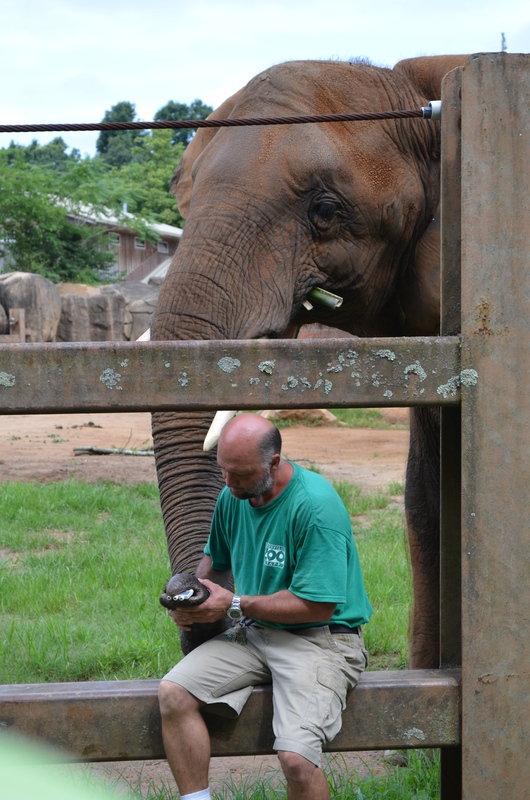 Today, an elephant played me a harmonica tune, and I remembered how to sing. I don’t even care that I have to clean the harmonica. 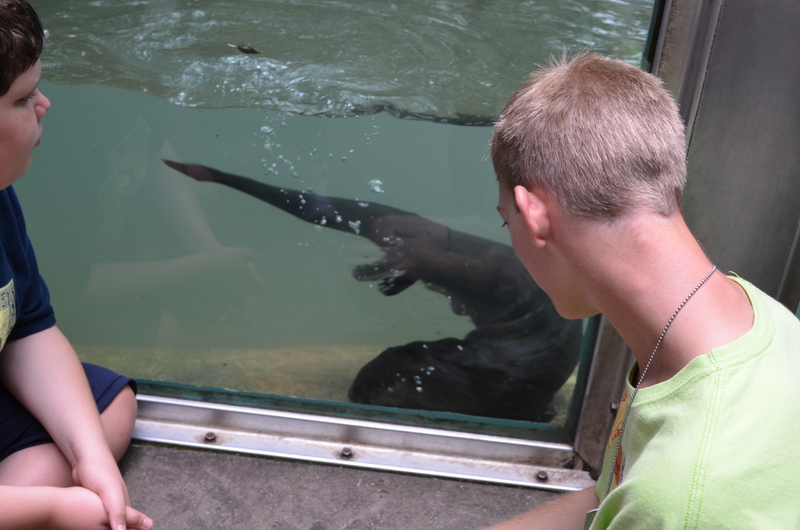 Today, an otter caught a snack, and I remembered there is wonder in the world. I wonder how she bends like that. 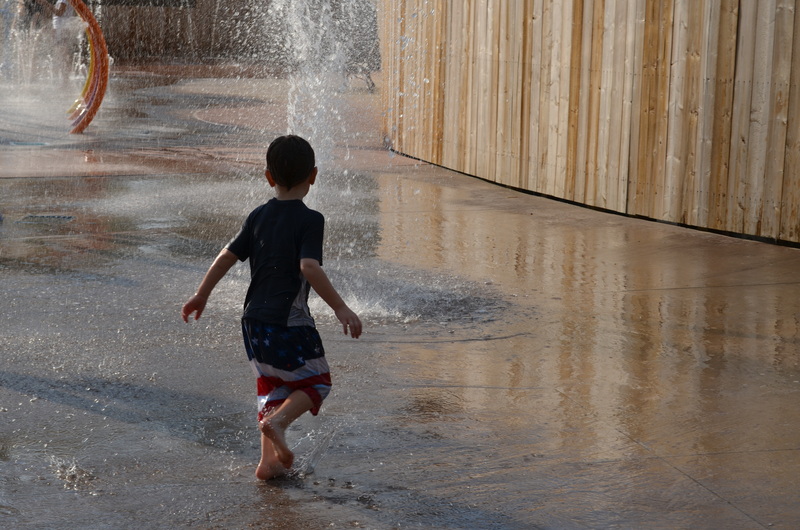 Today, there was a splash pad and ice cream, and I remembered how sweet life is. 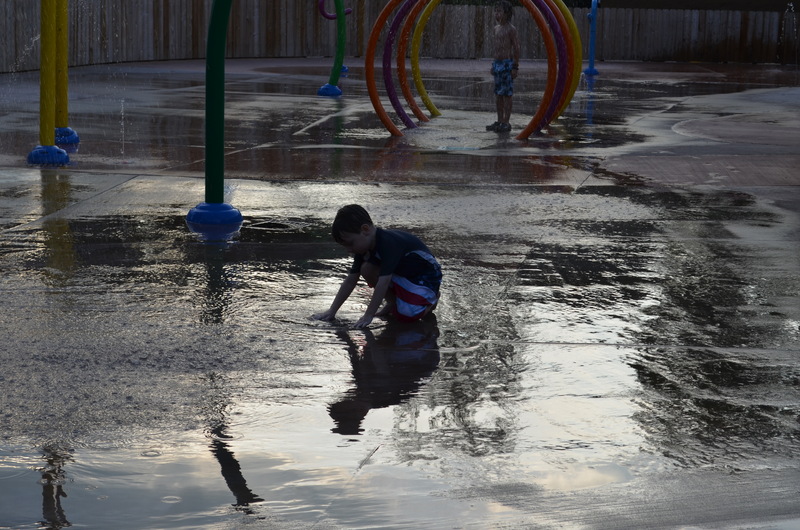 Today the water stopped, and I remembered I can make my own magic. Someone reminded me. Thanks for that, little buddy! Today, I remembered why I love what I do. Today was a blessing. There’s a new arrival at the zoo. I wanted to blog about it sooner, but I couldn’t. I’ll explain in just a bit. 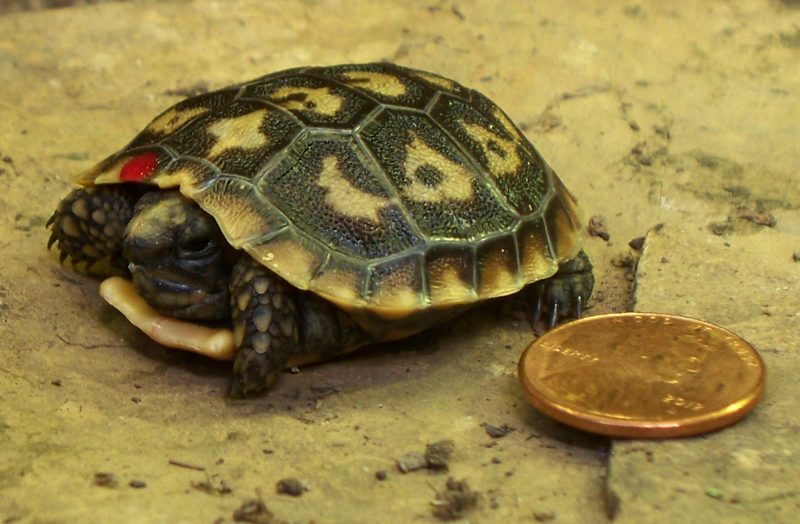 You remember Short Stack, the pancake tortoise that hatched in February? 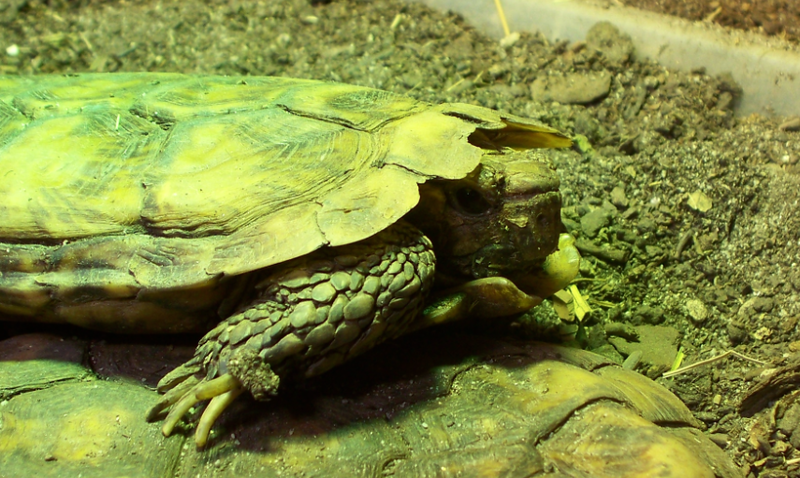 The zoo has two pairs of pancake tortoises. Both laid eggs this winter that were intact and able to be incubated. 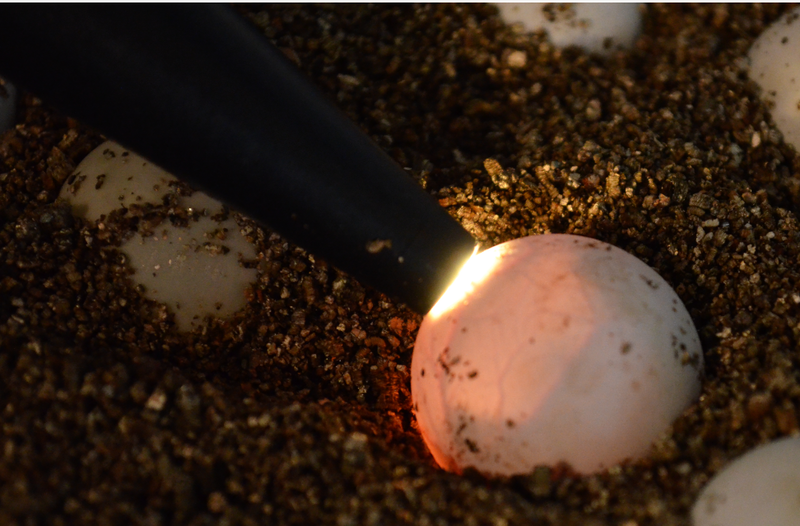 This species is apparently a little tricky to incubate, and there can be as much as 40 days’ variation in hatch-times, unlike mammal gestation which can often be narrowed down to a two day window. A couple of weeks ago, Short Stack was joined by our second pancake hatching. 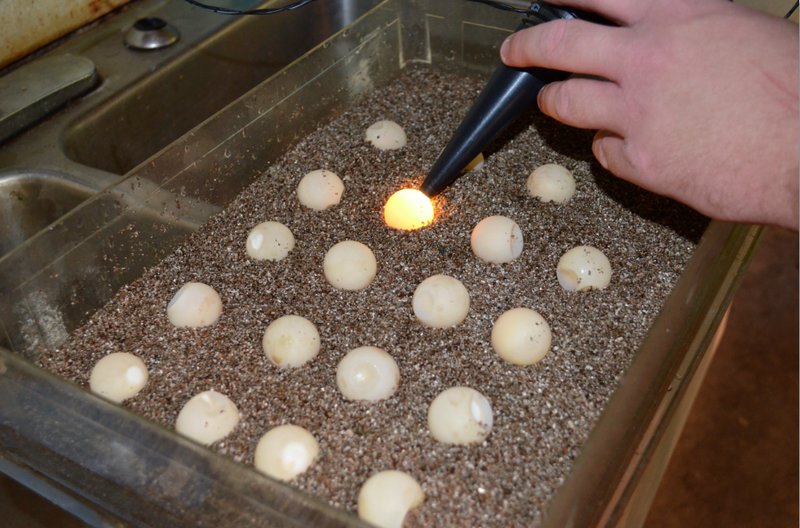 Each morning, keepers check the eggs in the incubator for signs if hatching, also known as pipping. The assistant curator knows how much I love this species, so he sent me an email to let me know the little critter was making its way into the world. I missed his email. Because I was already at the zoo. I got pictures. Crazy pictures. Remember this turtle from last year? See how its shell is folded over like a little burrito? And how after a few days it looked like this? It’s a Spiny Hill turtle. It took it a couple of days to flatten out. 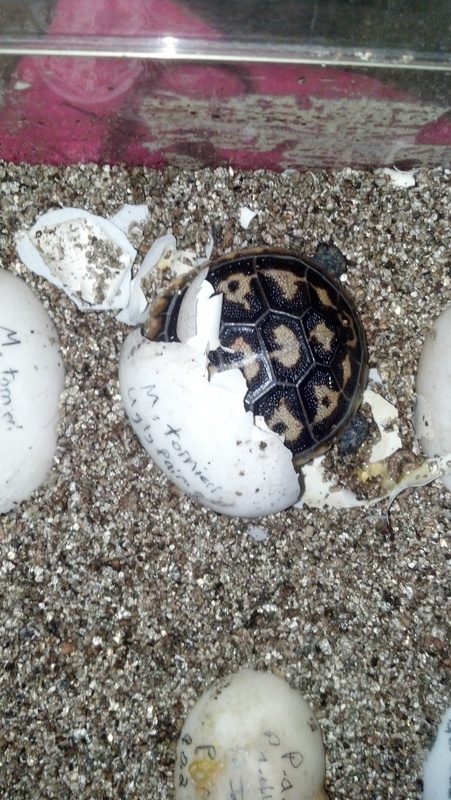 I thought all flat shelled tortoises and turtles developed in the egg the same way, with the sides folded down. Not Pancake tortoises! They actually develop rolled front to back. Look at how the baby flattens out over a few days’ time. Day 1 – lots of curvature. Look at the arch at the bottom of the shell. Day 2 – less curved, but still not flat enough. 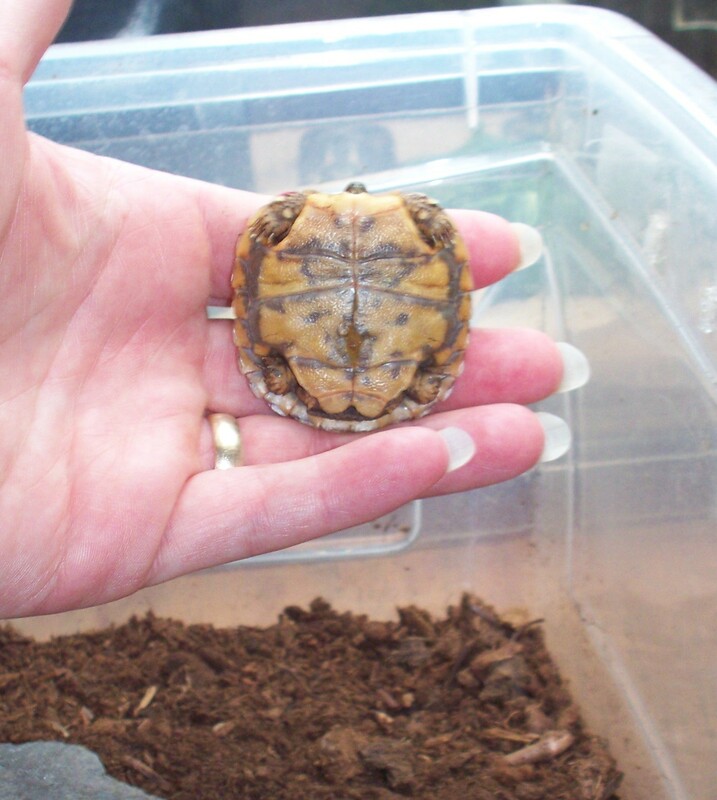 Day 1 – look at how wrinkled the plastron is. Like, it has actual wrinkles! Day 2 – It’s looking a little flatter. Check out that belly button! The reason it has taken so long to blog about this guy is because I don’t write about them until they have been accessioned (added) into the collection. And they can’t be accessioned without complete measurements of their shell. It’s hard to measure something that has been folded up like origami. It normally takes a couple of days for a tortoise to unfold completely. It took this guy about a week before it was flat enough to measure! Day 5. Still a little wrinkled. And here he is about two weeks after hatching, looking all ironed out. Finally. I love the markings on the shell. 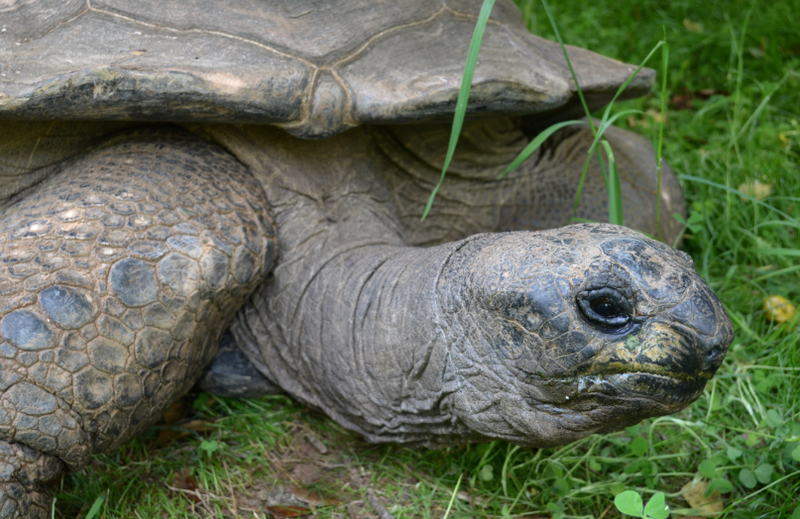 *** Nancy over at Not Quite Old asked why tortoises have a belly button at all. It was such a good question that I thought I’d answer it for those who are new to reptiles. Animals that develop in an egg are fed during their incubation by their yolk. They are attached to that yolk by an umbilical cord. After they emerge from the egg, the umbilicus closes. Sometimes that process takes a few days, sometimes traces can be seen a year later, but at that point it is nothing more than a mark on the shell. There are four babies hatching here. See them? In this box, we have two different subspecies of Madagascan spider tortoise; Pyxis arachnoides arachnoides and Pyxis arachnoides brygooi. I can tell the difference from here. I’ll show you how. P.a. brygooi like to burrow. 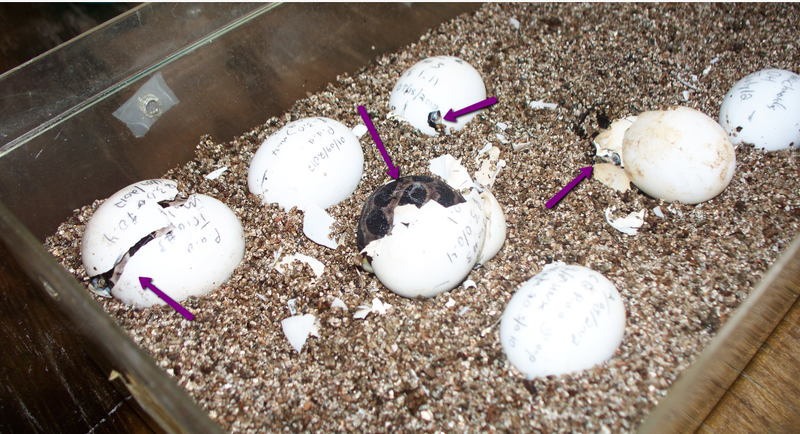 They hatch, they burrow. P. a. arachnoides hang around on top of the substrate. These babies are all genetically pretty valuable, as both species are critically endangered in their native Madagascar. 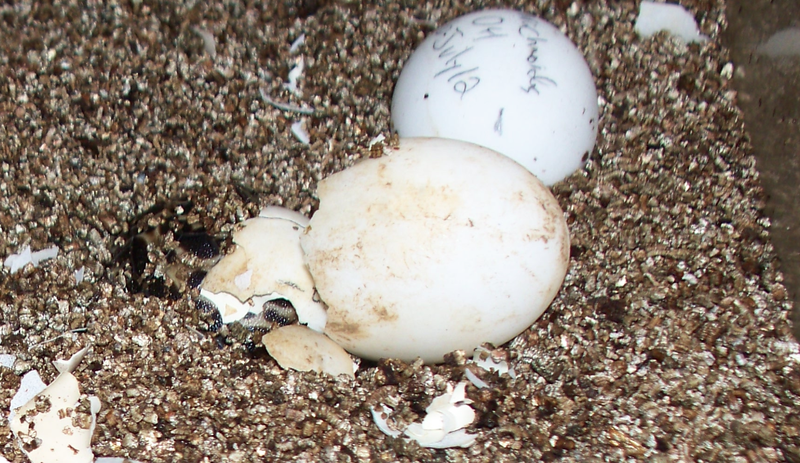 Any successful hatching is significant, but sometimes some offspring are even more valuable to the program. There’s someone I want to you meet, but allow me just a moment to tell you its story. When animals are taken out of the wild and reproduce, that next generation of offspring is known as F1. It’s not unusual for animals to reproduce in captivity after being removed from the wild. Tortoises, rhinos, cheetah, elephants. The real trick is in getting an F2, that next generation, one that is truly captive bred. F1 and F2. Sounds like a series of astromech droids, doesn’t it? 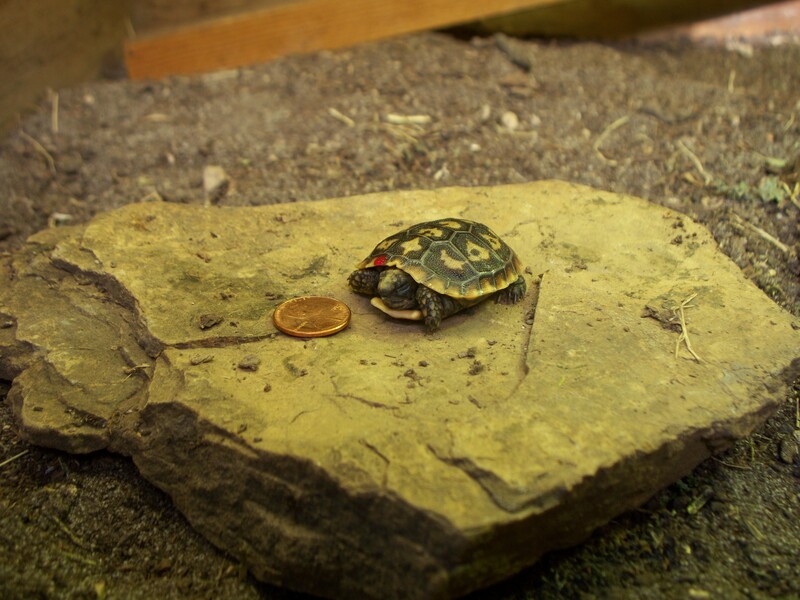 Now allow me to introduce you to our very first F2 Common Spider Tortoise. It may take a few weeks for its umbilicus to disappear completely. Currently there are tiny wrinkles around its belly button where it is closing up. It’s roughly the size of a quarter, the very first offspring of both parents. There are very few, if any, other F2 of this type anywhere in the world. 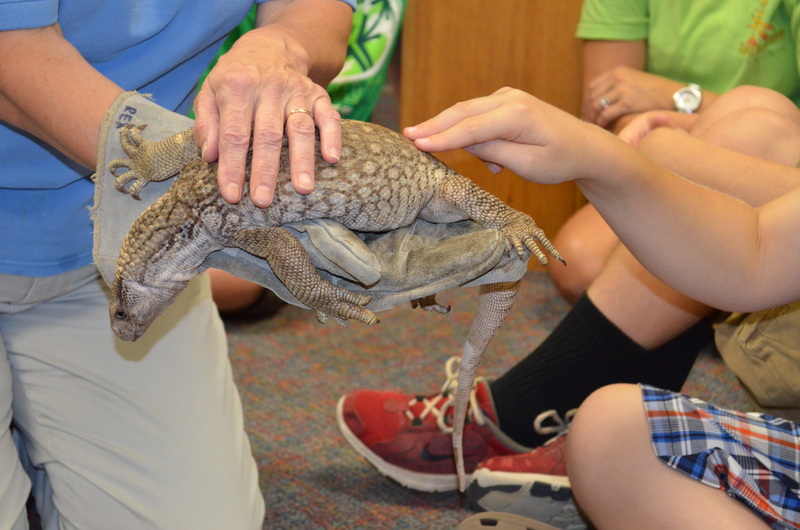 I am so proud of my zoo and their dedicated staff for what they have done to perpetuate this species! Well done, Michael! I’ve officially been taking care of tortoises in the Herpetology department at my zoo for two years now. Over that time, I have to admit I’ve found some favorites. 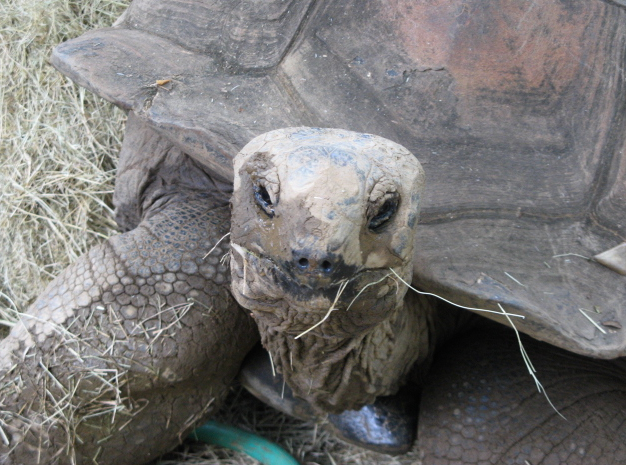 Ploughshare tortoise. One of the rarest animals in the entire world. There are fewer than 400 left in the wild. Their carapaces are etched to discourage theft. It does not hurt the tortoise. 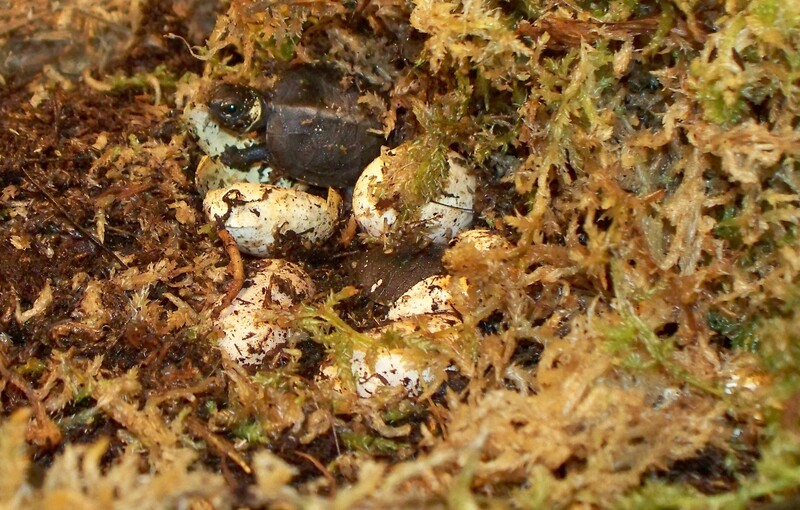 Bog turtles. This is one of my zoo’s special long-term projects. 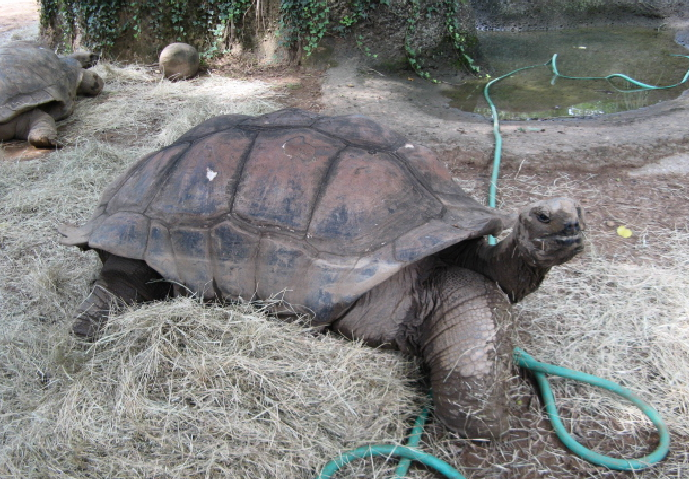 Actually, any tortoise breeding program is a long-term project, since it can take 10-25 years for them to get to breeding size. 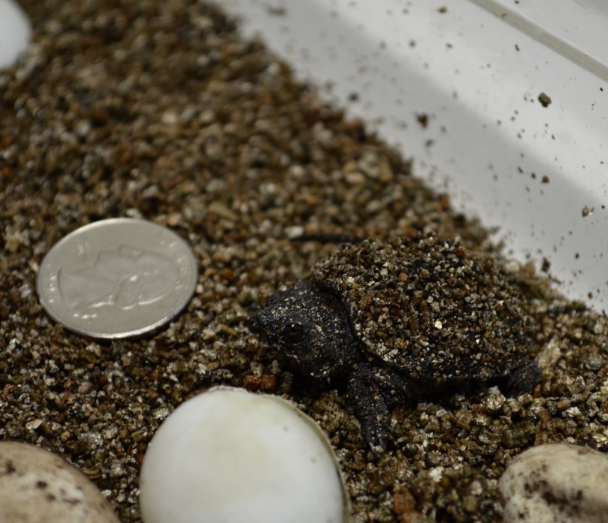 Spiny Hill turtle hatchling. The hatchlings are always my favorites. I love how squished up it is. 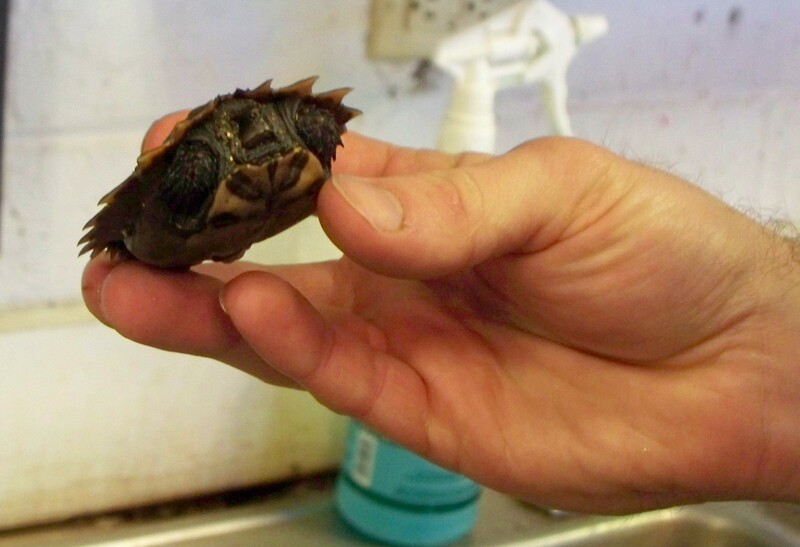 After hatching, this turtle unfolded into its flatter and more proper proportions. 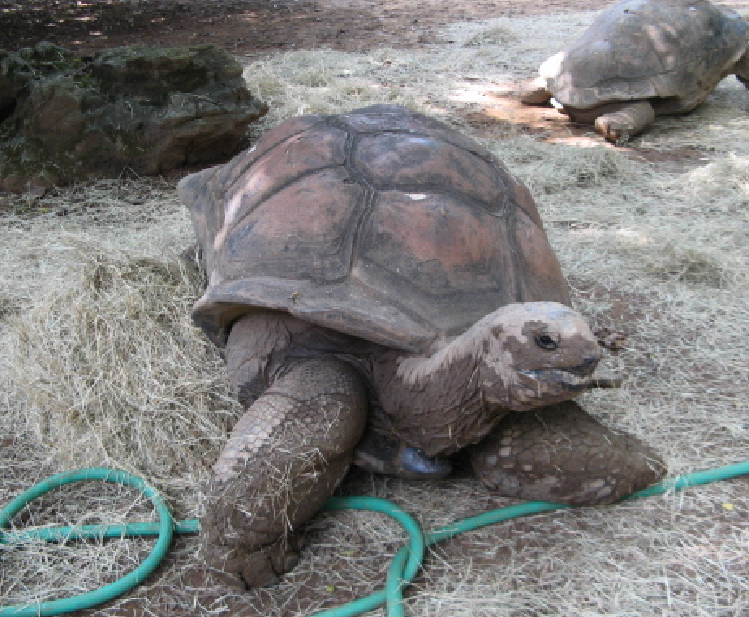 For 2 years, my favorite adult tortoises have been the pancake tortoises, Malacochersus tornieri. Please excuse the weird green color. Without a flash, my camera likes to break down the light from the ultraviolet lamps into greens. Pretty, right? 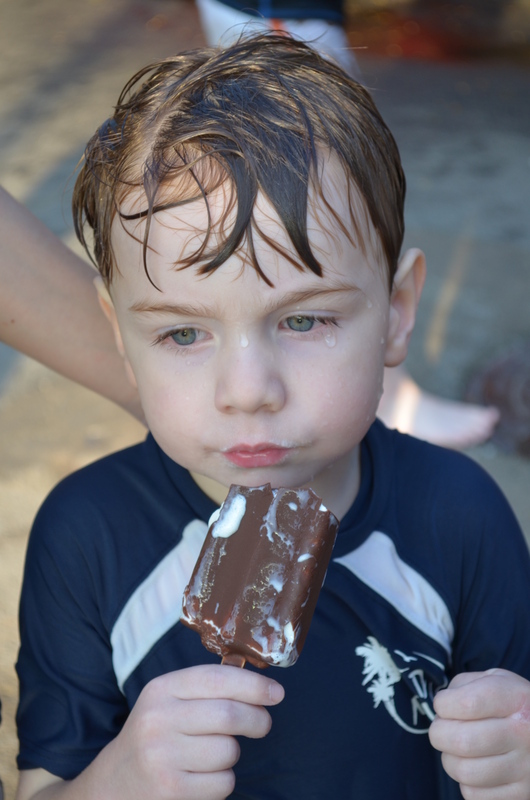 Click to enlarge and really get a look at that face! They are unbelievably cool. 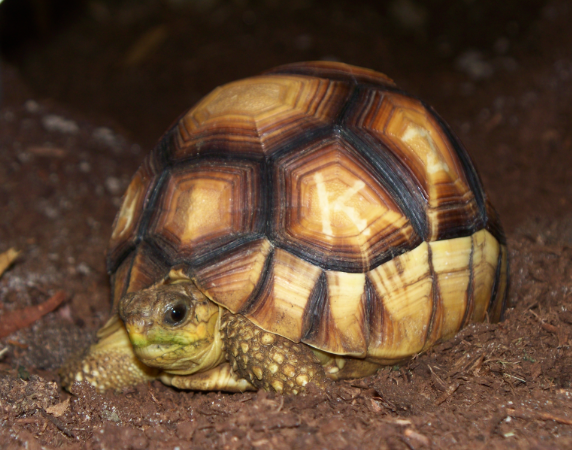 Instead of being rock-hard like other tortoise shells, the shell of the pancake tortoise is rather spongy.In the wilds of eastern Africa, they defend themselves by wedging tightly into narrow crevices in rock. Their conservation status in the wild is listed as Vulnerable, which means that their numbers are okay at the moment, but sudden loss of habitat will leave them in serious jeopardy. Without the rocky terrain, they cannot survive. For two years, I have been wishing and hoping for babies from our two pairs to no avail. The females haven’t been the most maternal and have scrambled the eggs before they could be retrieved. So frustrating! Until now. Last week was the best week ever. Within 24 hours, I finished my novel, hit a major blog milestone, and got to meet someone new and precious. Ladies and gentlemen, I bring you Short Stack. 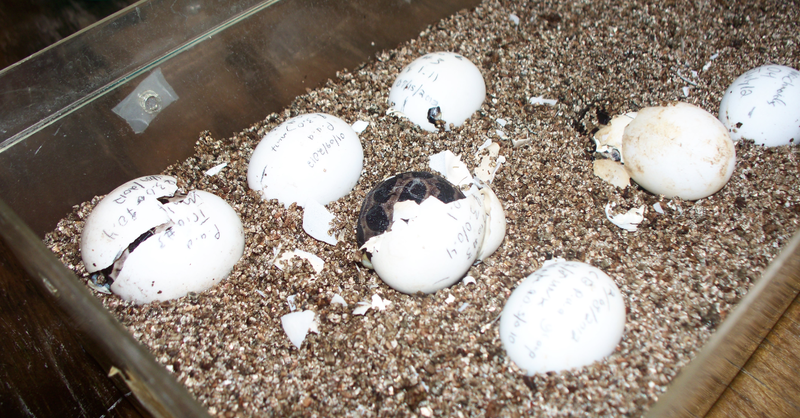 This species is interesting when it comes to hatching, too. 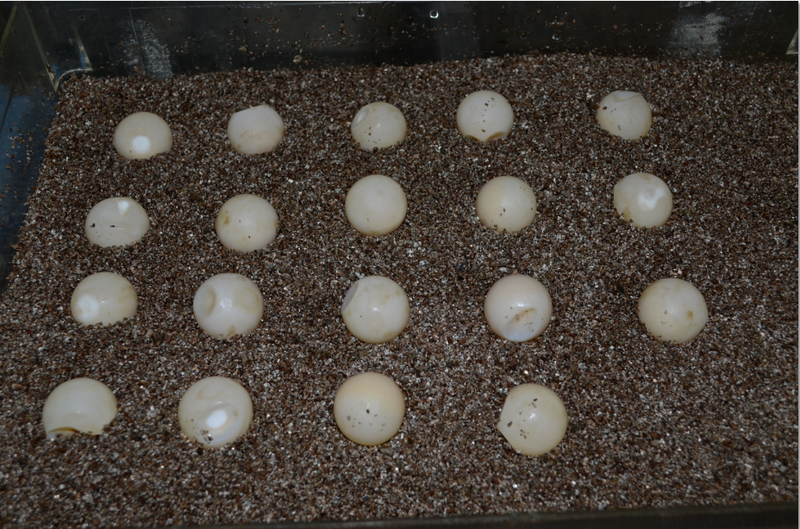 The incubation range is anywhere from 99 days to about 237 days. That’s a huge range. Other species tend to be a little more predictable. This guy (gal?) hatched at the lower end of the range, which is what caught me by surprise. Personally, I wasn’t expecting Short Stack to make an appearance until April. I do love surprises! See that tiny white crumb on the end of its nose? That’s called an egg tooth, and it’s what a baby reptile uses to shred the egg from the inside when it’s time to hatch. Let me know if you don’t see it. I’ll show it to you in the next post. Here’s some more exciting news. There’s another egg in the incubator, this one from the other pair. It has been candled and seems to be developing well. So that’s my week. What exciting things are going on in your world?